Renal cell carcinoma (RCC) is a tumor whose past is filled with failed treatments and unpreventable patient death. Fortunately, science is progressing at an ever increasing rate and novel discoveries are bringing new possibilities for patients with RCC. The future of RCC treatment is bright, and we believe that immunotherapy will realize much of its potential within the next decade. 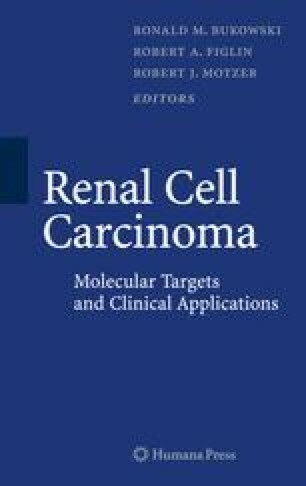 In this chapter, we discuss one of the newest discoveries in RCC tumor immunology: T-cell coinhibition. This chapter will first introduce key concepts of T-cell function and tumor immunology that are necessary for a good understanding of how coinhibition works. We then describe some of the key defects in immunity that are present in RCC. Finally, we propose a model to explain why certain renal tumors are eliminated by the immune system and others are not.